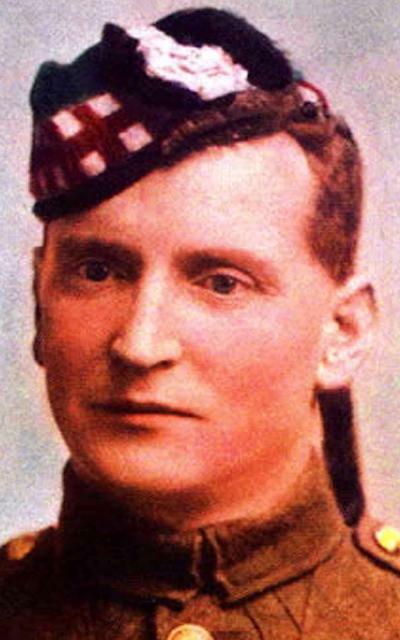 Daredevil war hero Sergeant Major John Skinner who was awarded a Victoria Cross by King George V will be remembered at a special ceremony in Glasgow tomorrow, Wednesday 16 August to mark the centenary of his act of valour. His investiture at Buckingham Palace on 26 September, 1917 was the second time the monarch had decorated Skinner. He'd presented him with the Distinguished Conduct Medal (DCM) at Glasgow Green, two years earlier. Skinner also received the Croix de Guerre in recognition of his VC heroism. A WW1 centenary paving stone in his memory will be unveiled by Glasgow's Lord Provost Eva Bolander, witnessed by proud relatives, outside the People's Palace, the museum that chronicles Glaswegians' lives on Wednesday at 2pm. It represents the seventh in a series of VC paving stones to be laid in the city. There are already four at the People's Palace, one within the University Chapel of the University of Glasgow and another at the Glasgow Academy War Memorial. The Victoria Cross is the highest award for gallantry a British or Commonwealth serviceman can receive. The Kings Own Scottish Borderer was described by Sir Beauvoir de Lisle, the KOSB's Commanding Officer, as "the bravest man I met in a war won by brave men." It was Sergeant Major Skinner's bravery at Passchendaele on 16 August 1917 that earned him the Victoria Cross. Soldier-journalist Lieutenant James Price Lloyd in a press release for the War Office recounted his bravery, in the face of heavy enemy fortification and fire: "In spite of the fact that Skinner had been wounded in the head, he hastily collected six men and dashed towards the block houses. The first he captured single-handed. He reappeared laboriously carrying two machine guns, one under each arm, and followed by the whole garrison as prisoners." He went on to capture the remaining block houses, rounding up 23 more prisoners, three more guns and two trench mortars." A colourful character, Skinner lied about his age (16) when he joined up. By the outbreak of the First World War he had already seen 14 years service in the Boer War in South Africa, followed by campaigns in India and the Middle East. Born to Walter and Mary Skinner (nee Kendrick) in Maryhill, the third son of a tailor, His eldest brother Peter had been apprenticed to his father at the upmarket gents' outfitters in Royal Exchange Square. The teenage Skinner clearly viewed the army as a more exciting prospect. His mother had died when he was aged six and his 12 year old sister Bessie, both of tuberculosis. A disease his oldest brother would later succumb to. This seasoned soldier's remarkable bravery was matched by reports of his recklessness. Wounds he suffered were as frequent as his demotions for ignoring regulations or for drinking. However, his army records also praise him as a very intelligent and hard-working infantryman. Earlier in August 1914, while promoted to acting sergeant with the 2nd Battalion in France Skinner was awarded the Distinguished Conduct Medal for scouting a wood following heavy enemy engagement. Over the next three years Skinner would regularly be mentioned in news reports for returning to service after being hospitalised. Action at Mons, Bethune and Ypres as well as the disastrous Gallipoli campaign had left Skinner with various shrapnel and gunshot wounds. His daring and willingness to be at the front of the action secured him three mentions in dispatches. His Great nephew Stewart Skinner (70), who has travelled from Sydney, Australia to attend the ceremony said: "I'm extremely proud. I always get goosebumps when I talk about him. By all accounts, as well as being incredibly brave, he was full of mischief: drunk on duty, drunk in charge of a horse, women in barracks. "The King apparently asked him, when he pinned the VC on his tunic: 'How did you manage to keep all these prisoners?' and he replied: 'Once I get hold of something I don't let go.'" Great niece Myra Grant (65) (nee Skinner), from Kilbarchin said: "I have known about him since I was a child. My father, his nephew, never said much about him. It was his half-sisters, my elderly Great-aunts, Bessie, Maud and Marie who had a bronze plaque of him in the dining room who told me about the family's war hero. My father had a roll of honour, a book that I would read, and was fascinated by, as a child. "We're all very excited and proud. We'll be meeting family we never even knew existed. My Great uncle was obviously a very brave man. He loved soldiering and did not seem to care for civilian life. He was also very humble about his achievements." The Lord Provost in her role as Lord Lieutenant said: "It's a huge privilege to be here to remember Sergeant Major Skinner. His is a remarkable story of courage and skilful soldiering. One hundred years ago his heroism was very well documented by the media in our city and beyond. Today, by unveiling this commemorative paving stone we will ensure his story is remembered. I am particularly pleased to be joined by his family and that I, as First Citizen, have this opportunity to express the city's gratitude and my own, for his remarkable bravery." 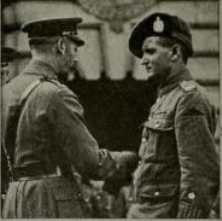 During his investiture at Buckingham Palace on 26 September, 1917, Sergeant Major Skinner received his VC wearing seven wound stripes - badges on a soldier's sleeve denoting their injuries. He was also presented to Glasgow City Council and visited his old schools, including Allan Glen Boys' School. It was reported, his father and stepmother only learned he was to receive the decoration from fellow-soldiers who were home on leave. Days later Skinner married Annie Lee, a ship-brokers clerk, was promoted to warrant officer, and was presented with the French Croix de Guerre for the valour that earned him his VC. It was following the customary fortnight leave following the VC ceremony that he found himself posted to Edinburgh, but once again, ignored orders and returned to his unit in Belgium, risking a court-martial. There, on 17 March, 1918, his luck ran out at the age of 35 years, when he was fatally shot trying to rescue a wounded man. At his funeral in Vlamertinghe, Belgium on March 19 his coffin was carried 17 miles for burial, ignoring the rule that the dead were to be buried near the trenches. A total of nine VC's attended the funeral - six of them as pall-bearers - including a General and a Private standing shoulder to shoulder, all from the same 29th Division. It is understood to be the only time six VCs have acted as pall-bearers, and therefore unique in British military history. A soldier's soldier - as remarkable in death as in life.